in order to verify account. We emailed you password reset instructions. If you haven't received an email from us, wait a few minutes and check your email's spam and junk filters. It's been announced that the upcoming movie, "Nobou no Shiro", has postponed its release date to fall 2012. The film was originally scheduled to hit box offices on September 17th. The reason for this delay is because of the content of the movie. �According to the distributing agency, Asmik Ace, "This movie includes the dynamic images of a 'Water Attack' (a strategy in which one surrounds the enemy's castle with a soil wall and runs water into there). �Although this 'water attack' is historically accurate, we have discussed whether or not the representation of the 'water attack' is proper to be released at this time. Ultimately, we have decided to postpone the release." 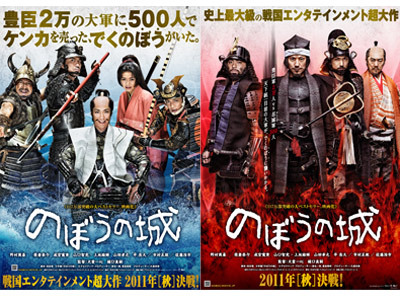 "Nobou no Shiro" is a historical movie from the Sengoku Era, in which 500 warriors from the Oshi castle's army fights against 20,000 of Toyotomi Hideyoshi's army. �Kyogen stage actor�Nomura Mansai stars in this movie as the leader of the "Oshi-jou", and he'll be joined by�Eikiura Nana, Narimiya Hiroki, Yamaguchi Tomomitsu, Kamiji Yusuke, Yamada Takayuki, Hira Takehiro, Ichimura Masachika, and Sato Koichi. Plastic Tree takes over the May edition of "SHOXX"
Itano Tomomi is a retro sweetheart for "Cutie"
Please choose your reason for reporting this comment. • NU'EST's Minhyun to appear on 'Happy Together 4' as a special MC! Copyright © 2007-2019 6Theory Media, LLC. All Rights Reserved.